Do you find the information on this website helpful? If so, please consider making a donation to help us continue to provide valuable free information on controlling and reversing high blood pressure to visitors just like you. 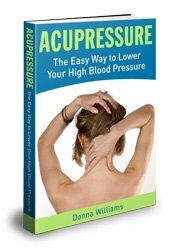 As a small token of my appreciation, I'll send you a copy of my ebook, Acupressure - The Easy Way To Lower Your High Blood Pressure. Your contribution will go a long way toward helping to offset the cost of researching material and maintaining the website. Rest assured that when you click the Donate button, you will land on a page that's encrypted and secure. Your information is safe with PayPal, one of the largest payment processors on the Internet. On this website I write about my complete healing from a disease that is pronounced "incurable". I share the story of my own life experiences with this silent killer and how it nearly killed me. One major fact I have discovered is that when the human body is given the right nutrients and it is able to clear itself of poisonous substances, the body can respond positively to incurable chronic diseases. Reversal happens. My research has given me so much insight and led me to several knowledgeable, experienced people who have made major headway in reversing high blood pressure. I share that information on this site for free. Donations from visitors allow me to continue to do that. It is my goal to continue to share valuable, proven information, fact based alternative therapies, useful tips, delicious heart healthy recipes, and up-to-date news on breakthroughs in controlling and reversing HBP. It is also my goal to continue to offer that for FREE. Researching and confirming every bit of the information posted on info-on-high-blood-pressure.com takes copious amounts of time and hundreds and hundreds of dollars. That's why I need your support! It will make your journey to a healthier life that much easier. You can send your donation through PayPal right now by clicking on the "Donate" button and using your credit card or PayPal account. It is a fast, secure and a very effective way to show your appreciation for what we offer on this site. Paypal allows you to donate in US Dollars no matter what your country's currency. After the completion of your transaction, a receipt for your donation will be emailed to you along with the downloadable link for your gift.